What do I do With Rat Droppings in my Attic? If you currently have or recently had rats in your attic, you’ll have to deal with a clean-up at some point. After all, you don’t want to just leave animal feces up there with all your boxes and belongings! So how do you handle it? Before figuring out how to handle the droppings in your attic, you might need to identify what the problem animal is and if you are still dealing with the infestation. Listen for squeaks or scurrying sounds, especially at night. The best option here is to have a professional come out and do a full inspection. You don’t want to have to do a bunch of clean up and replacement of materials if you have rats that are going to come back and destroy it again. Once you know the infestation is gone and you’ve prevented the animals from coming back, you’ll need to assess the severity of the damage. Any insulation that has been touched by the droppings is compromised and should be replaced. In addition, there may be urine and other damage from chewing and nesting to be handled. 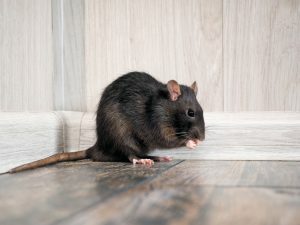 Rats tend to stay close to walls, so be sure to note whether there are any grease and dirt smudges along the outside that will need to be cleaned. We always urge you to use a professional for removal and restoration of your attic because it is necessary to handle it with proper care and expertise. Regardless of your experience, you should never touch rat droppings with bare hands. Wear gloves and face masks when going into the affected area and use the correct sanitizing tools. Often, you’ll have to replace your insulation as well, so ensure you are wearing correct protection from the fiberglass. If you’re dealing with rat droppings in your attic, just stay calm and give us a call at 305-258-3587. We’ll inspect your home and make a restoration plan as well as ensure you don’t have an infestation hanging around. Additionally, we’ll suggest any precautions you need to protect your home from future infestations.